By	Dr John Hemmings; et al. 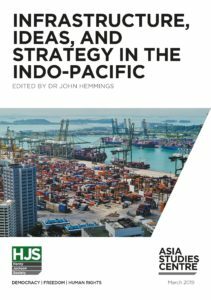 An expert panel of scholars have authored a series of eight essays released as “Infrastructure, Ideas, and Strategy in the Indo-Pacific”, a report by the Henry Jackson Society. The essays explore the concept of the ‘Indo-Pacific’ and its ramifications for geostrategic thinking. The report also explores the role or prospective role of the UK in the Indo-Pacific in an essay authored by David Scott. The Indo-Pacific is rapidly becoming the centre of the world’s economy. By 2050, it will account for over half of global GDP and become a fulcrum point between old and new powers, for deciding regional architecture. The Indo-Pacific is the place where the future of global power – and hence global order – will be decided. This economic growth has enmeshed the Indo-Pacific in emerging geopolitical and maritime rivalries, reviving “Mahanian” approaches toward sea-power: states are now modernising their naval power to secure those sea lanes crucial to their national security. Infrastructure, particularly ports, play both a security and economic role in the Indo-Pacific. The first chapter, written by Dr Kun-Chin Lin from Cambridge University, looks at how China’s strategic approach towards sea lane security, container shipping trends, and port development has become a proxy for geopolitical manoeuvring and, as a result, has framed much of the discussion. The second chapter examines Japan’s role in the creation of the Indo-Pacific and its infrastructure strategy. pan’s role in the creation of the Indo-Pacific and its infrastructure strategy. To some extent, in this latter capability, Dr Kei Koga, from Nanyang Technological University (NTU), shows how Japan has been the fastest mover in this area, highlighting a hitherto unknown Japanese assertiveness. This leads into the third chapter, by Professor Rahul Roy-Chaudhuri explores India’s strategic understanding of the Indo-Pacific concept, examining both its origins as well as its evolution. The fourth chapter, by Professor Harsh Pant, from the Observer Reach Foundation (ORF) in New Delhi, which examines how infrastructure and investment feed into India’s overarching grand strategy. The fifth chapter, written by Dr Euan Graham, of La Trobe Asia, examines how Australia has attempted to rationalise the Indo-Pacific concept across the various aspects of its foreign and economic policy bureaucracy in order to deal with the intersection between trade and geopolitical leverage. The sixth chapter, by Ian Easton from Project 2049 Institute, examines how the US’ late arrival to the concept – during a major shift in its relationship with China – has produced an infrastructure strategy that perhaps the most overtly characterised by geopolitical competition. He also notes how the US – with its vast foreign policy machine and alliance-management history – has become an organising point for the other powers. In the seventh chapter, David Scott lays out Britain’s take on the Indo-Pacific and sketches out some early indicators of directions London might pursue as Brexit fades from memory. In the eighth chapter, Dr Satoru Nagao, from the Hudson Institute, provides a robust declaration of intent on how Quad members should tackle what he sees as China’s global ambitions, in BRI and the Maritime Silk Road. The issues explored within the report could not be more timely, at a roundtable in December 2018, the Asian Development Bank (ADB) reported the Indo-Pacific region would need an estimated £1.29 trillion every year until 2030 in infrastructure investment to support growth and meet the regional infrastructure challenges posed by climate change. The ADB identified a funding gap of around £567 billion a year beyond what countries and institutions are currently investing in regional infrastructure. China’s much-vaunted “Belt and Road Initiative” (BRI) – a grand strategic narrative that ties together commerce, infrastructure development and geopolitical power – helps close that funding gap. But its use of debt-diplomacy to gain control of ports as collateral looks increasingly geostrategic. There is now a growing business and geostrategic case for the UK to collaborate with other regional powers to provide alternatives to the Chinese model. These eight essays explore how other states view the Indo-Pacific concept and what geo-economic role they envision it containing. The concept of the ‘Indo-Pacific’ is more than just a competing strategy: it is a framework or policy basket that seeks to explain and influence the changing geopolitical patterns, interests and powers across the region and beyond. These essays on the Indo-Pacific could not be appearing at a better time. Much of the comment and the controversy about the rise of China has focused on Beijing’s differences with Washington and on whether the United States will be overtaken by China as the dominant power in the Far East. But as important has been the growing co-operation and alliances formed by all China’s neighbours from Japan to India, including Australia, South Korea, Thailand and many others. Why else should Tokyo and Delhi be having joint naval exercises other than shared concern at China’s growing economic and military power and its determination to impose its will in the South China Sea and elsewhere? This Henry Jackson Society collection of essays is timely, thoughtful and informative. The Indo-Pacific dimension will be as important as China over the years to come. As Dr John Hemmings, the editor of the essays, concludes the rise of the Indo-Pacific may be as important to the wider world as the rise of China. The Henry Jackson Society’s latest report focuses our attention on how the ‘Indo-Pacific’ is becoming ever more critical to Britain’s long-term interests. From a concept created by Japan and India, the Indo-Pacific is now shaping the thinking of policy-makers from Canberra to Washington to London. Our answers to the Indo-Pacific’s policy challenges will significantly shape our world. For Britain to fully benefit from the Indo-Pacific’s many economic opportunities, it must also contribute to resolving the region’s numerous security challenges. Britain cannot merely look to roll-over economic agreements and negotiate new trade deals across the Indo-Pacific without committing to being an active security partner. That will involve more naval deployments and basing in-region. To do so, however, will require Britain to commit greater resources to the Royal Navy to help defend the freedom of the sea lanes and the rules-based order upon which we depend. That is the emerging policy challenge of the Indo-Pacific. By 2050, the Indo-Pacific is expected to account for over 50% of global GDP – and this fact will significantly re-shape our global order. This new collection of essays, assembled by the Henry Jackson Society, provides expert analysis of the ‘Indo-Pacific’ as a regional foreign policy concept and traces out its implications for geo-politics, maritime security, trade and development across the region and globally. For Global Britain, the Indo-Pacific presents some major new challenges and opportunities. This timely collection of essays about the Indo-Pacific will help us to better understand this vital region and to improve our engagement in it and to help shape the emerging global security and trade architecture. The Indo-Pacific region is a key part of the global economy. As its importance has grown so have geopolitical and particularly maritime rivalries emerged. States across the Indo- Pacific are modernising their militaries, with an emphasis on naval power to ensure their national security. This partly reflects the geography of the region, large sea areas, island chains and archipelagos, but also the fact that sea lanes are also crucial for surety of access and trade. An added complication is that the sea-lanes through the region are crucial to the global economy and the very survival of countries such as Japan. There is a lacuna in effective infrastructure in large parts of the region. China has identified helping with that infrastructure as a strategic opportunity with its much-vaunted “Belt and Road Initiative” (BRI). For example, its use of debt-diplomacy to gain control of ports as collateral, reinforces the concern that BRI is being used to further China’s wider geopolitical aims. This new collection of essays from the Henry Jackson Society suggests there are sound geopolitical, economic and security reasons for the UK to collaborate with other powers to provide alternatives to the Chinese development model across the Indo-Pacific.